Advanced ancient civilizations are a big topic of interest among researchers, historians, archaeologists, and scientists. Every single year we are gifted with a mysterious find that has us questioning the origins of the human race and imagining the cultures which roamed the earth before us. We have found much evidence to suggest that there may have been civilizations in existence before us which were intellectually, and even technologically superior. That being said, this theory is still thought to be quite fantastical; despite all of the evidence which has been brought to light in recent years to support this notion, it is still largely ignored by the mainstream. If you are interested in looking at some of this evidence, a great place to start is with author Graham Hancock, in his book titled The Magicians of The Gods. If you start talking about the lost, ancient city of Atlantis, most people will probably think that you’re living in ‘la la’ land. Many people are unaware that this city has been seriously studied for hundreds of years. For example, we can see that it was a subject of significant importance for researchers at the Smithsonian Institution, as emphasized by their Annual Report of the Board of Regents of The Smithsonian Institution for the year ending June 30th, 1915. “After a long period of disdainful indifference, observe how in the last few years science is returning to the study of Atlantis. How many naturalists, geologists, zoologists, or botanists are asking one another today whether Plato has not transmitted to us, with slight amplification, a page from the actual history of mankind. “No affirmation is yet permissible; but it seems more and more evident that a vast region, continental or made up of great islands, has collapsed west of the Pillars of Hercules, otherwise called the Straight of Gibraltar, and that its collapse occurred in the not far distant past. You can read this full report here, starting on page 219. Plato, the ancient Greek philosopher, provides a description of Atlantis in his dialogue Critias, which was never completed. Atlantis was inhabited by ‘earth-born’ and ‘primitive’ human beings. One of them was wooed by the god Poseidon, who interbred with the human beings, and they eventually bore five children. This interbreeding between gods and humans is a common theme in many historical texts found throughout the world. The land was divided into concentric zones of land and water. Two zones of land and three zones of water surrounded the central island, which had warm springs of water and cold springs of water. Atlantis became an established country, with a wise government and an industry that sprung them to advanced technological heights — beyond even what we have reached today. Atlantis had limitless resources, wild animals, and precious metals, and was heavily populated. Atlantis was full of large and beautiful palaces, temples, docks, and a network of various bridges and canals that united different sections of the kingdom. Atlantis had a number of gardens, full of hot and cold springs. There were countless temples, public baths, and exercise facilities for both man and animal. 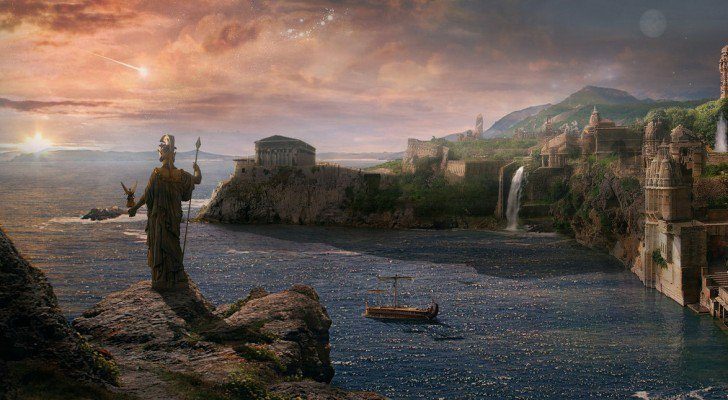 These are the essential points Plato makes about Atlantis. He described it as a great and powerful empire, almost magical, and said that this was the same empire which attacked the Hellenic states. The Egyptian connection is also interesting to bring up here because Crantor, another ancient Greek philosopher, asserted that the Egyptian priests declared the story of Atlantis to be written upon pillars which were still preserved circa 300 B.C. Manly P Hall has noted that, before this cataclysm, a portion of the population left and did not succumb to the egoistic tendencies which apparently led to downfall of Atlantis. Was the philosophic, religious, and scientific knowledge of Atlantis passed on? There are many similarities between the reported teachings of Atlantis and those of other cultures, such as the Mayas of Central America. One of the most interesting parts of this story, to me, is the fact that this place is often remembered as a place of glory, light, and abundance, which it was. Bizzarre ESP Experiments or Shades of Media Bias?